There was an audible buzz at Civil Service Live London on 6 October in anticipation of a talk by the former conman who inspired the hit film Catch Me if You Can. And Frank W. Abagnale soon proved he was no impostor - though his presentation was so over-subscribed, catch me if you can would be a good promotional slogan for his speaking engagements. He spoke about his colourful past and how, as an FBI security consultant, he has been advising governments, banks and other businesses on countering fraud for 40 years. That’s far longer than his career as a con artist. He sees it as his mission is to make public servants aware that most successful frauds are the result of human error or failing to spot that something is wrong. He was clear that we are the first line of defence for public money, and fraud awareness is a necessity for any role in the public sector. The Cabinet Office’s Fraud and Error team were delighted to have booked this unique expert. They had met him in March and realised how powerful his story and passion were. They were keen for him to help raise awareness of fraud and just how pervasive it is, not least in government. Who better? And the learning environment of Civil Service Live was an ideal platform for him. The Fraud and Error team has had many successes in counter-fraud in the last few years, and this reputation for excellence and innovation secured us this world-class fraud expert and speaker. He certainly did not disappoint. Frank Abagnale’s session was fully booked less than a week after registration opened. The 300-capacity Mountbatten Room, one of the largest conference spaces in the Queen Elizabeth II Centre, was full to overflowing well before the start time, with standing room only for any latecomers. 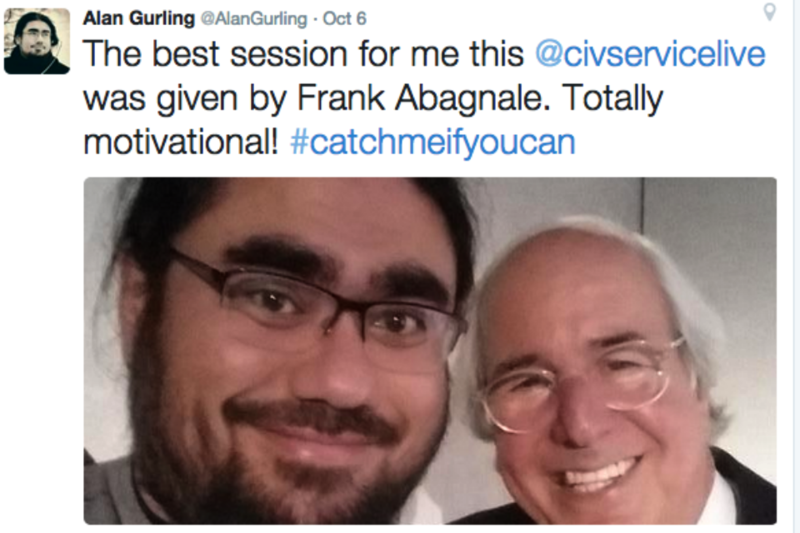 CS Live delegate Alan Gurling tweeted this selfie with Frank Abagnale after his talk. Frank began with anecdotes about his first forays into fraud. These and other dubious exploits - including impersonating airline pilots - ultimately led to his portrayal by Leonardo DiCaprio in Steven Spielberg’s movie. With the Civil Service in the process of increasing its professional expertise and working in new ways, he feels this is the perfect time to build a strong anti-fraud capability. He took a moment to reflect, reminding his audience that, while his actions had won him pop-culture fame and notoriety, they were legally and ethically wrong. Frank has refused pardons from three US presidents. He believes the work he has done for his country in counter-fraud and innovating prevention methods is his penance and a powerful legacy. As a leading expert in fraud, Frank is supportive of the UK Government, and its Fraud Error and Debt team, mirroring the US approach by realising that digitisation offers a potentially fertile ground for fraudsters and that government must be on the front foot to counter them. Frank Abagnale really was the most inspiring, interesting and fascinating speaker and I’ve been telling everyone all about his talk. The session was completely packed out with a thoroughly attentive audience, we couldn’t hear a pin drop the entire hour. It has certainly got me thinking differently about Identity Fraud! May I ask a, possibly obvious, question. Frank Abagnale is an admitted con man - and a very good one at that. Why would you believe a word he says? Imaad, are you able to share the outputs from this session? As someone who works within Fraud, Error and Debt, I would be really interested in hearing what Frank Abagnale had to say on the methods he advises to prevent fraud and error entering the system. Was this session filmed for others to see? Like – ( Ryan – 28/10/2015) I would like to hear what Frank Abagnale had to say regarding fraud. working in fraud this is an area of work I would like to go into as a civil servant, I would be good at working in the fraud environment. If the meeting with Framk Abagnal was video please can you forward me a copy on a dvd.. I would also like to hear what Frank had to say. I have been interested in working for fraud prevention team (never got the chance). If it is at all possible to get a copy of the said DVD please include me also. "He sees it as his mission is to make public servants aware that most successful frauds are the result of human error or failing to spot that something is wrong." Am I the only one to spot the (unintended?) irony of the mistake in this sentence - the superfluous 'is'? I've always looked at systems from a criminal perspective - what can I do to get around/make use of any systems? When setting up a system always approach it from the perspective of the non-compliant person and never assume that everyone will follow the rules. It's helpful when thinking about guidance advice, too. 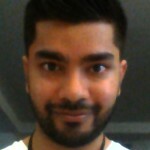 The e-mail advertising this article states: Imaad from the Fraud, Error and Debt team discusses the talk and gives some handy tips straight from Frank! but where are the handy tips in the article?? Hi, like so many of these comments you had me on the edge of my seat as i started to read about Frank's presentation tips and advice and what to look out for on the fraudsters...but nothing. How can those who where not at his presentation reap the benefits of Franks wisdom? As Krista asks - where are the handy tips in this artical? This is all very well and positive. Your biggest problem is that the public no longer trust. With the best intentions, people don't anymore believe that a change would improve there lifestyle or financial situation. They have heard it all before. The main group of sceptics are the elderly. Afraid of change , unable to grasp new technology, they are being isolated from the new age. When one department states one thing another contradicts what they have been told.so they stop seeking help. As it just confuses them? This is normal human behaviour. Afraid to appear ignorant. And more importantly criticised for not knowing what would be simple for others they after trying to get a answer to there questions .stop asking. Computers and software advance only the ones that can already use them? Please could you forward me a copy of the DVD please or make it available to all HMCTS not just a select few, as it would be wise to have all staff benefit from Franks talk. I was totallymesmerized by Frank Abagnale's talk on 06/10/15, Not onlya brief synopsis of his life, but how fraud and cyber crime is so easy. As someone who has had their bank card cloned and someone tried to spend my hard earned monies in Bankok; I can understand where Frank was coming from. My son was also a victim of ID theft. If there is a video of his presentation I would love a copy so I can share it with colleagues. Hi Jason, i would love to see your notes please-it sounds like it was a fascinating presentation and will particularly be of interest to the OED team am i work on. Hi Jason, I would also be interested to read a copy of your notes, if you can forward them to me. Please can a transcript or video of the talk be made available? It would be of interest to colleagues in the HMRC small business stratgey team who are working on the hidden economy. Sorry. Awaiting eye surgery to correct a profound squint, I find reading more than a few words difficult as images overlap and double up. Constatly need to halt reading, re focus and start again: pretty stressful, hard work. Surgery at Moorfields Eye Hospital pre- Christmas, 2015,hopefully.Please excuse me NOT taking part in this exercise. Thank you. Hi, I would be very interested in this too - is it too late to send me a copy . Thank you.